Potato carrot curry recipe or potato carrot curry for chapathi and poori is a very easy to follow South Indian Kerala style recipe and it is healthy as well as delicious! 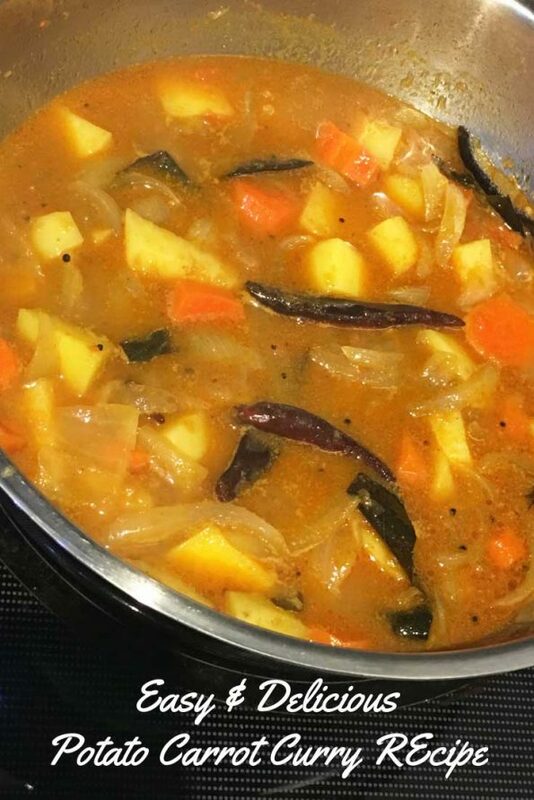 You can easily make delicious potato carrot curry on stove top which can be used as a side dish with rice for lunch or dinner or which can be used as a side dish for chapathi, poori, dosa or idli, just like this easy potato curry for chapathi, easy potato masala gravy or this easy potato peas curry for chapathi. So here is how I made this mixed potato carrot curry for chapathi & poori following this simple and easy potato carrot curry recipe. 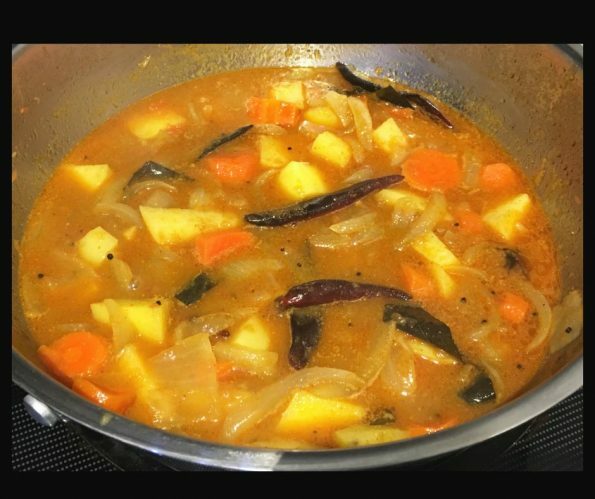 Easily learn how to make potato carrot curry for chapathi and poori which can also be enjoyed as a side dish with rice, dosa etc. I used a South Indian Kerala style seasoning with mustard seeds, curry leaves and red chilies to prepare this simple and delicious curry. Peel the potatoes and carrots (a good quality potato peeler like this one will help to peel the vegetables easily) and cut them in to medium sized pieces. I just sliced the carrots in round, with little thickness. Keep the diced potatoes and carrots aside. Remove the skin and chop the onions. Add the chopped onions and saute for few minutes (about 7 to 8 minutes) or until the onions are transparent or browned (even better if its little browned). Add the diced potatoes and carrots to the pan, add salt and saute for about 2 minutes. Add the 1/4 cup of water and bring the mixture to a boil. As the mixture starts boiling, close the pan and cook in low heat for about 3 minutes. Meanwhile prepare the tomato puree by blending the tomatoes and water in a blender until smooth. Add this to the pan and saute for about 2 minutes or until the mixture starts boiling. As the mixture starts boiling, cover the pan with lid and cook well for about 7 to 8 minutes or until the vegetables are well cooked and soft. Add all the spices and stir well to blend with the gravy and let it cook for another 1 to 2 minutes. The mixed vegetable curry with potatoes and carrots in tomato gravy is ready to serve! Serve the delicious potato carrot curry with rice for lunch or dinner or as a side dish with chapathi, poori, dosa or idli for breakfast & dinner! You may also enjoy this potato carrot curry as it is without any sides if you wish, which will make it a clean eating vegetarian dish filled with the goodness of vegetables and spices. You can also enjoy this as a spicy and filling soup or stew which is full of flavor. I also used chopped onions to this dish. The gravy is made using fresh tomatoes which is made into a puree and which is mixed along with other veggies with healthy & exotic spices. The best thing about this potato carrot curry recipe is that the dish is full of flavor and it is so easy to prepare. The light sweetness of carrots combine with the yummy potatoes and onions to blend with the exotic spices in fresh tomato gravy, to make this exotic potato carrot curry which goes perfectly well as a side dish for rice, cha[athi, dosa or idli! 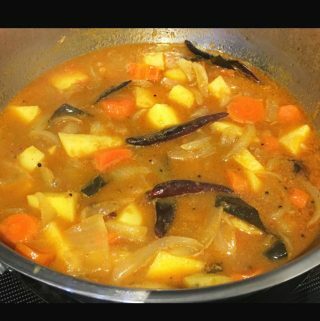 Hope you found this post on potato carrot curry recipe or easy Indian style potato carrot curry for chapathi and poori helpful!